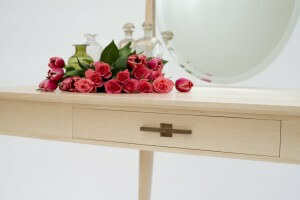 What could be more poignant and romantic than a bespoke dressing table? 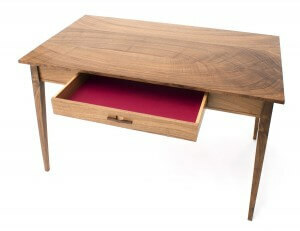 Our new and perfectly formed ‘Rosa’ dressing table is being launched for Spring 2013. The idea stemmed from an exquisite desk we made called ‘Ronald’, which was similarly detailed, the same size and finished in English walnut. A wonderful piece, but perhaps more of a gentleman’s desk. So we wondered if we could make something similar with more feminine qualities. We consciously made Rosa in beautiful native ash, because of its pale straw colour and characterful grain texture, but also for its strength and vitality. Ash has been in the headlines for all the wrong reasons recently, so we wanted to give it a positive story and show off its sophisticated side. Rosa is the perfect combination of glamour and practicality. It exudes light, a sense of calm and sanctuary, perfect for the private, personal space of a bedroom. The design gives a nod in the direction of ‘50’s retro without being slavish. It features a semi-circular top, with elegant tapered legs, topped with a large oval, bevelled mirror. 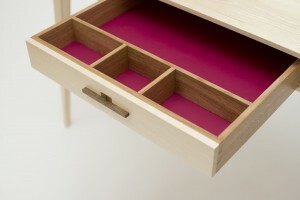 The table has a generous internal drawer, made in oak, lined with a charming surprise: a raspberry pink Andrew Muirhead leather lining, complete with oak dividers. The sleek design, like all of our work, complements both contemporary and traditional bedroom styles. The oval mirror was chosen over the traditional rectangle design, to make it more flexible for use in a window, alcove or corner. As a timber and a tree ash has been really underrated over the years. It was regarded as a workhorse, used for Windsor chairs and other ‘low brow’ venacular furniture for the masses. 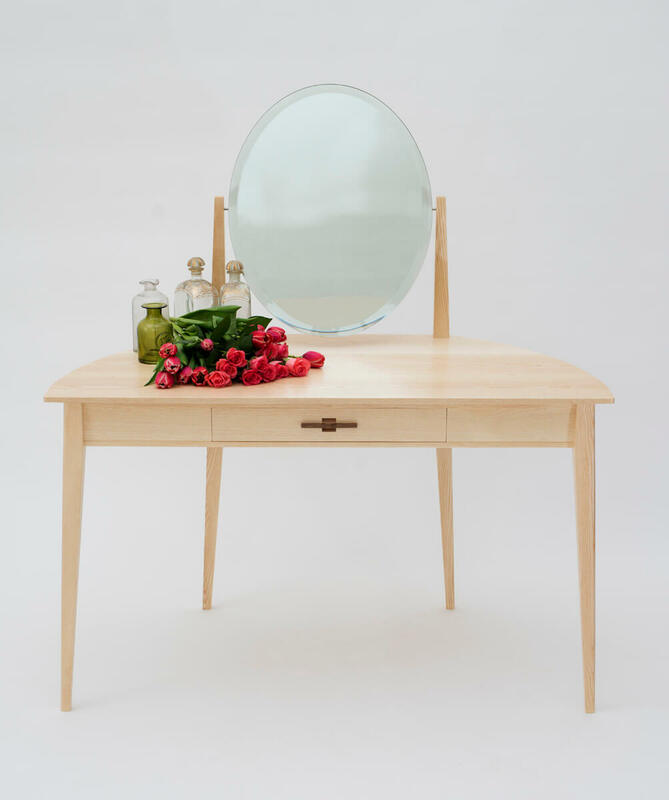 By using Ash for this dressing table, we’re giving it a chance to shine and show its sophisticated side. We hope anyone who loves Ash trees as we do will enjoy seeing the timber revitalised and treasured in this way. I’ve written more about ash die back, and this tree’s place in the English countryside, click here to read more. ‘Rosa’ and her brother ‘Ronald’ both measure 120cms x 60cms x 75cms high. Height to the top of the mirror on ‘Rosa’ is 135cms. Both have one drawer which is 48cms wide x 44cms deep. Rosa and Ronald are both £4250 in these timbers.